My family loved our trip to San Francisco last month. I was amazed at all there was to do with kids and how easy it was to get around the city. The one thing I highly recommend for all tourists is to get a San Francisco CityPASS. The CityPASS gives you entry to San Francisco’s top attractions. The CityPASS comes in booklet form. When you arrive at the attraction that you want to visit you pass your booklet to the ticket window and they let you in. By using the CityPASS you will save 42% off all the attractions listed above. I also found it extremely convenient to not have to pull out my wallet and pay for admission at every stop we made. Perhaps the biggest perk of the pass was unlimited Cable Car rides for 3 days. My son is crazy about Cable Cars so we used the CityPASS to hop on and off many times during our stay. You can purchase your CityPASS online or at any of the locations listed above. The CityPASS is $125.67 CAD for adults and $93.19 CAD for children. My family used every single ticket in our San Francisco CityPASS booklet. I loved all the attractions included. I truly believe that anyone using the San Francisco CityPASS will have a great feel for the city. The attractions included in the pass are top attractions that you don’t want to miss! There are CityPASS booklets available for so many cities (including New York City, Boston, and Toronto). I would absolutely get a CityPASS for other cities I visit. I’d love to know, have you used a CityPASS when traveling? What did you enjoy about it? Disclosure: CityPASS provided complimentary passes to facilitate this review. 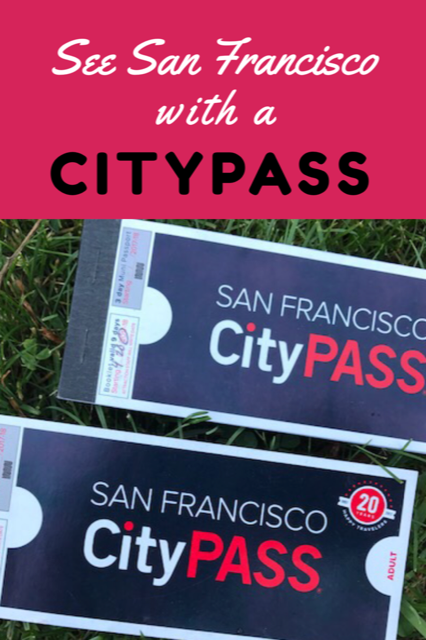 All thoughts and opinions are my own and I truly think the CityPASS is a great way to explore any city! That is a great way to save money and these sounds like great attraction and the price isn’t bad considering what you get. City Passes are simply fantastic and a definite must if you are going to be spending a few days in one of the cities that is included. I got them for my daughter, her hubby and my grandson for Seattle before they moved. They were able to see so many amazing places and attractions they might not have been able to without the city pass. I wish more cities in the US and Canada would join the program, it is truly a fantastic way to see a city’s best attractions! Some day I will get to San Francisco. It is one of those cities that I want to see on a great vacay. I have City Passes in other cities and they are worth their weight in gold! I have used CityPass in the past for my trips to Toronto, New York and Atlanta. I enjoyed the experience (and saving money) and the ease. I love the idea of city passes, I’m just disappointed that there aren’t many for Canada. I believe there’s only a Toronto & Montreal city passes. This is the first I have heard of a city pass, this is so awesome and would save a lot of hassle, so cool!! Very cool! I would actually look into the one for home – it’s fun going to places we haven’t been in a while! That’s way more convenient than having to pay everywhere!